Mohu is turning out-of-commission cable boxes into raw material for cord cutters with the ReLeaf antenna. The ReLeaf is an omni-directional, flat-panel, indoor antenna with a 30-mile range. Like Mohu’s other indoor antennas, you plug it directly into any television (provided it has coaxial input), and can get free broadcast channels such as ABC and CBS over-the-air, many of them in high definition. But unlike the rest of Mohu’s lineup, the ReLeaf’s plastic base casing is made entirely from recycled cable and satellite set-top boxes. Mohu says that one pound of plastic from these boxes is enough to create 40 antenna casings. 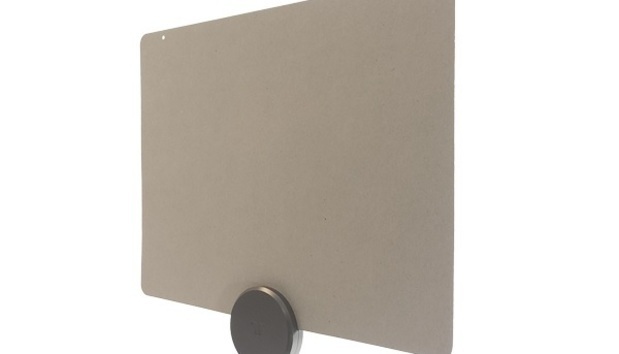 The panel itself consists of 30 percent post-consumer recycled cardboard, and Mohu ships the antenna in a cardboard box with instructions printed directly on it. The product may seem like a marketing gimmick—and it is, to some extent, with a launch timed around International Earth Day on May 17—but Mohu tells TechHive that the ReLeaf is a permanent addition to the company’s lineup. Down the road, Mohu wants to make its entire product line more environmentally friendly, though it’s unclear if crushed cable boxes will always be involved. For now, showing your disdain for cable boxes—and appreciation for the environment—comes at a premium: The ReLeaf costs $50, compared to $40 for Mohu’s standard 30-mile Leaf antenna. Why this matters: Symbolism aside, cutting cable TV can be better for the environment. Cable boxes are notorious energy hogs, consuming up to 35W of power according to the Los Angeles Times. Antennas don’t even require a power source, and can be paired with streaming boxes that consume far less power than a cable box does. Recycling the cable box plastic is one way to cut down on the environmental impact of making the switch, as more people are doing.